CrossFit Skirmish trainers are pretty special, with credentials which include CrossFit plus a range of other qualifications and experience. These include: sports science degrees, British weightlifting qualifications and other types of sports coaching (Judo, Rugby and Specialist Kids training). Our trainers are skilled at programming and scale all workouts to your current skill level to ensure that safe technique is not compromised. In addition to general class coaching, you can also book 121 sessions with any of them to perfect technique or indeed provide you with accellerated programming and personal training. Alexander, Sasha for short, is our Head Trainer and a Russian power house. Sasha’s first passion was Judo, where he was both an excellent coach and Scottish Champion, representing both Scotland & the UK at International level. He then moved into MMA (Mixed Martial Arts), becoming a British Medalist in MMA and a Semi Professional Fighter. However, on a visit to Canada in 1999, Sasha discovered CrossFit. He describes himself as ‘bambi on ice’ after trying FRAN which broke him! He was shocked to discover that CrossFit was tougher than any training regime he had tried before but also far more rewarding. He was an overnight convert and has been working hard to open CrossFit Skirmish ever since. In addition to CrossFit Certifications, Sasha is a qualified Judo and British Weight Lifting Coach. 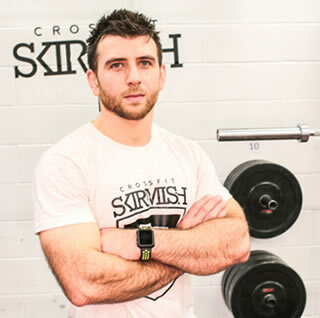 He has his own successful Fitness & Supplement Shop Battlebox.co.uk, CrossFit Skirmish’s online shop and has also worked with Dimitri Klokov, the CrossFit and lifting legend, completing Dimitri’s ‘Winner’ Seminar course. Theo, is a Spartan warrior from Greece who has lived in Edinburgh for 2 years. He is a sports and fitness professional with and education and hands on experience that is impressive. He originally studied Physical Education and Sports Science with a specialty in basketball coaching (BSc, 2011-2014) which led him to gain theoretical know-how (e.g. anatomy, physiology, biomechanics, psychology), and develop practical coaching skills in multiple sports including basketball, swimming, gymnastics, weightlifting, track and field, football, volleyball, handball. This included coaching youths in both primary and secondary schools. 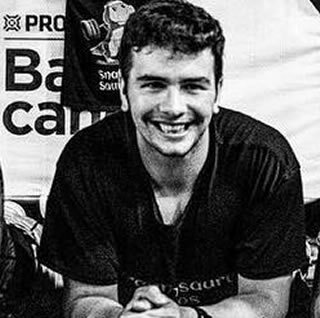 He first encountered CrossFit in 2013, realising how effective it was for general strength and conditioning as well as a way to improve sports performance, he became a CrossFit Level 1 Trainer and CrossFit Judge. Theo’s thirst for knowledge and sports performance is insatiable, adding to his knowledge and qualifications as follows: Advanced Health and Exercise Specialist EREPS Level 6, Personal trainer EREPS Level 4, ELEIKO WEIGHTLIFTING FOR SPORTS L1, UK Anti-doping Accredited Advisor, Sports Conditioning Workshop by ACE, BLS/AED PROVIDER COURSE by ERC European Resuscitation Council, STRENGTH IN TEAM SPORTS by Barca Innovation Hub, 1st SPORT NUTRITION CONFERENCE by Barca Innovation Hub. In 2017, he began a Masters Degree (MSc) in Sport Performance Enhancement (2017-2018). He learnt how to apply theoretical concepts and develop practical professional skills for situations that sports scientists encounter on a daily basis. He got involved in scientific methods, biomechanics and performance enhancement, Psychological interventions for sport performance enhancement, applied physiology and sport performance, plus sport science support for performance athletes. It was during this time that Theo starting coaching with CrossFit Skirmish and became an asset to our team. Theo is a positive and motivational person, believing that “if you have a body, you are an athlete”. He coaches with humility and supports all of his athletes, irrespective of their skills or capabilities. We are lucky to have Theo on team. so far, 95% of those who have tasted, have joined! 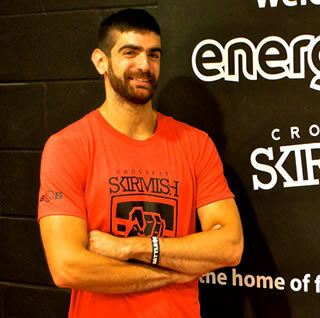 CrossFit Skirmish membership includes Energy Gym too!